Don't judge a book by its cover. We've all heard this phrase a million times, but in some cases, you can judge a book (or CD) by its cover. Once look at the dungeons & dragons cover art, the band name, and the album title, and you can conclude that this is certainly a power metal album. Your conclusion would be correct. However, any assumption that Metallic Tragedy is just another generic power metal release cluttering an already saturated scene, would lead me to object. Sure, Metallic Tragedy takes us down a very familiar road, but it is a worth while journey for fans of this type of music. 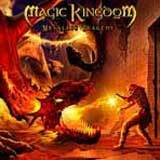 Not exactly known as a metal hotbed, Magic Kingdom hail from Belgium and are lead by guitar virtuoso Dushan Petrossi. Taking a page from the Yngwie Malmsteen legacy, Petrossi shows his impressive talents at playing flamboyant, neoclassical guitar throughout the album. The instrumental track, Black Magic Castle is a nice showcasing of the man's abilities, actually sounding very similar to an instrumental track that you might find on an old Yngwie album. Luckily, Petrossi doesn't let a big ego get the best of him, as the songs found on this album are not simply fronts for excessive soloing and shred work. Before the originality police chastise this album for not breaking any new ground, I will concede that this album isn't anything new, but it's not trying to be. Dushan Petrossi wanted to take an adequate amount of time to write songs and come up with a really good album. I have to say that the man has succeeded at that goal. Magic Kingdom have combined neoclassical and speed metal sound in such a way that hasn't grabbed my attention since the Visions album from Stratovarius. As I said before, Petrossi isn't shy with his guitar solos and shredding, but he doesn't allow that aspect of the music to overshadow the interesting, well thought song structures. Speedy power metal, featuring very fast riffing and double bass drumming forms the backbone of Magic Kingdom's sound. The neoclassical guitar work provided by Dushan Petrossi really gives the sound of this band a personality, something I feel is important in such a saturated genre of metal. Lead vocalist Max Leclerq also deserves some credit as well for his melodic, powerful, and passionate vocal performance. His voice reminds me of sort of a mix between Johnny Gioeili (Axel Rudi Pell, Hardline), Thomas Rettke (Heavens Gate), and Oliver Hartmann (ex At Vance). Appropriately enough, Hartmann contributes to this album in the form of lead vocal duties on Flying Pyramids and Master of Madness, as well as backing vocals throughout the album. As for the harmony vocals, they are very full and rich, succeeding to make the chorus lines very memorable and effective. The final track, also the title track clocks in at 13 and a half minutes, and deserves a special note. To say the least, this is one of the most diverse power metal songs I have heard in a while. Featuring numerous tempo and time changes, Metallic Tragedy takes the listener on quite a journey. The song features operatic female vocals, traditional vocals of Leclerq, and even some Black Metal shrieks and death metal howls. You could almost call this track a metal opera contained in one song with so many difference influences and moods on display. With this release, Magic Kingdom have solidified themselves as one of Limb Music's stronger bands. Although Metallic Tragedy doesn't necessarily offer anything new to the metal scene or blow me away, it does offer something very good and worthwhile. Fans of neoclassical metal should especially enjoy this release, while fans of traditional metal should still find this release to rise above the crowd of mediocrity. A unique personality provided by Dushan Petrossi, backed up by strong performances by the rest of this band make this album an interesting listen.